If you’re anything like me, you're always on the lookout for new makeup products. I’m guilty of taking a Sephora trip once or ehm, twice a month to find products that outdo my currents. I have a few solid faves but was never quite happy with my go-to under-eye concealer. Lack of sleep? Hungover? Late night with the boy? Totally understand. Dark circles under the eyes are inevitable at times, they aren’t cute, and the little buggers are a pain to cover. Not to mention under eye concealers can be tricky, and all the ones I’ve tried fell short in some way: too dewy, cakey, thin, outlines crow-eye wrinkles, wears off… you name it. I’m here to come to the rescue…. It’s literally like a little friend holding your hand after a hangover, patting your back saying "don’t worry, I got you, girl"
It’s full coverage, but it’s also smooth, light-weight and blends SO WELL. There’s no need to reapply throughout the day/night because that stuff isn't going anywhere. There have been multiple occasions when I’m getting dolled up with my friends, have them try it, and they're buying a couple tubes of it the next day… And I get snapchats from them with their “new face”. 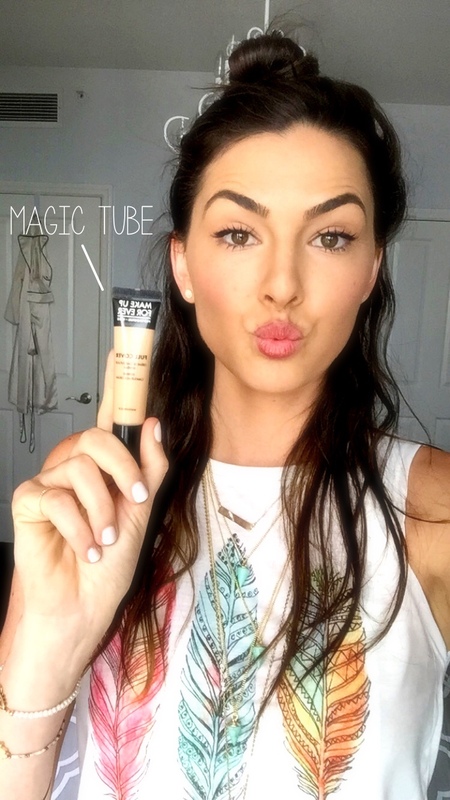 Magic in a tube, I say. Can you tell I had a good night by my hair? HA! So trust me when I say dark circles are alive and well under that concealer. What shade to buy? I’m not “tan” per se but I’m also not pale. I go with #7 which is called “sand”. Sephora told me that #7 is by far the most popular choice, so chances are this is probably the one you want. It’s pretty neutral and gives the under eyes a slightlyyy lighter look than the rest of the face (which is what you want!). Moisturize your face, and apply foundation of choice. Dab a few dots of this product under eyes in the shape of an upside down triangle. Start with less + add more if needed. Blend with damp beauty blender. TIP: lay down and spend a couple minutes rubbing an ice-cube underneath the eyes before applying makeup. It’ll help take away the puffiness. What beauty product can you not live without! ?